Turkey isn’t just for Thanksgiving. Especially when you wrap it in bacon. 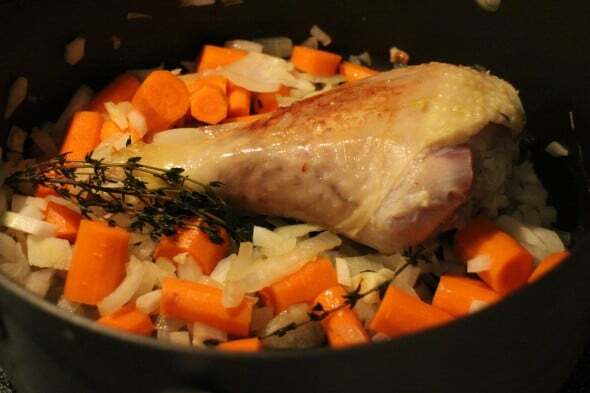 Turkey legs are a great thing to keep in the freezer to add flavor to split pea soup, stocks or stews, but other than grilling or roasting them, I don’t do much else with them. This recipe is one for everyone you know who loves turkey, and it’s definitely worth sharing on Facebook so you can find it when you’re planning your Thanksgiving menu. The more I explore turkey recipes, the more I enjoy turkey throughout the year and the marriage of kosher beef bacon and turkey drumsticks is simply perfect. 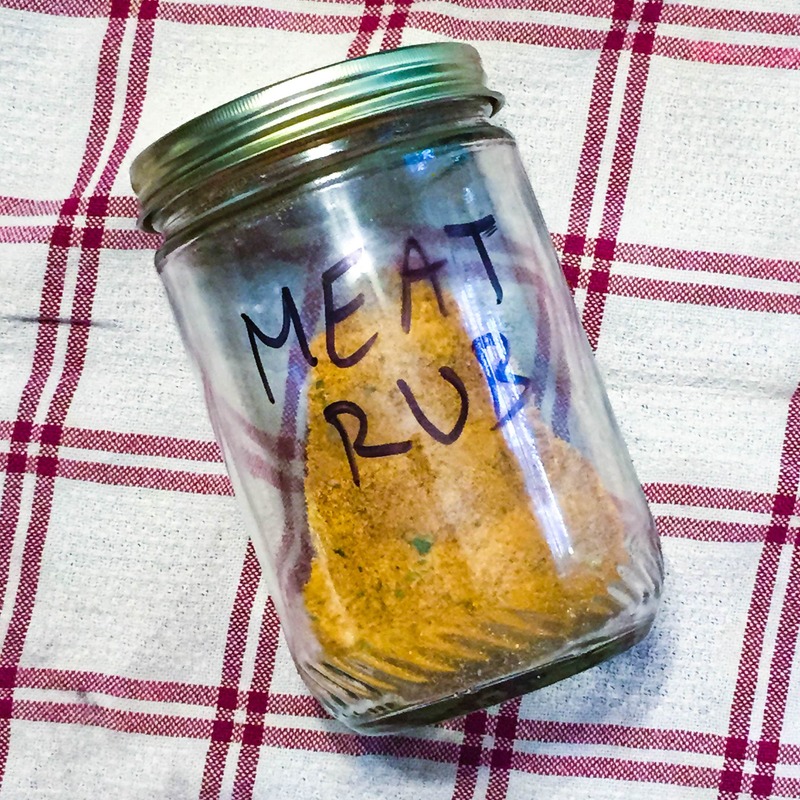 In terms of flavor, I used a simple meat rub of fennel seed, celery salt, garlic powder, cumin, salt, paprika, cilantro and white pepper. This is something I have started to use as seasoning for turkey and for creating the crust on my grilled London Broil or the delicious steaks from KOL Foods. If you haven’t heard of KOL Foods before, I invite you to visit all the recipes I have created using their meat, fish and poultry (those lamb shanks last month were delicious and I made another batch this weekend). As always, it’s a pleasure to work with the folks at KOL Foods to promote their mission of healthy, moral and green eating. KOL Foods are a company that care about paying their farmers a livable wage and raising their animals in a hormone-free and healthy environment. Their focus of green energy, clean and healthy eating is a beacon of light in the food industry and you can taste it in the quality of the meat. 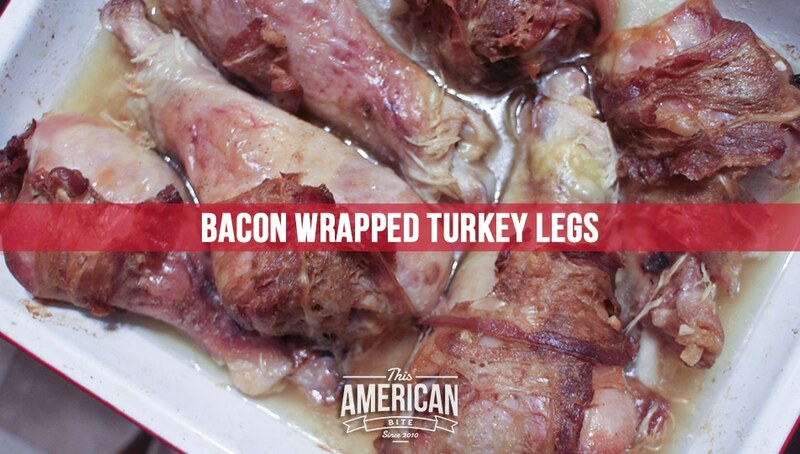 I wrapped each turkey drumstick with three pieces of bacon but if you want to step it up a notch, go for seven or eight pieces of kosher bacon per leg. 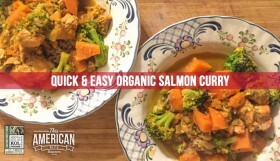 This isn’t a recipe that is particularly difficult or time consuming to make. Keep scrolling down for the full recipe and method for this dish, but if you’re looking for the cliff notes it’s as simple as season, wrap and roast. A couple of hours later, these guys will be waiting for you! Do me a huge favor, and promise me you’ll save all those natural juices too. Use it for cooking! I like to add it to my split pea soup. *For the poultry rub I combined equal parts of celery salt, garlic powder, fennel seed and paprika. 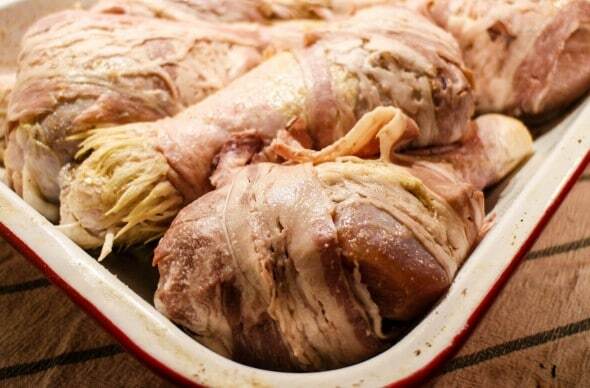 If your turkey legs are frozen, defrost them by leaving them in the refrigerator overnight. 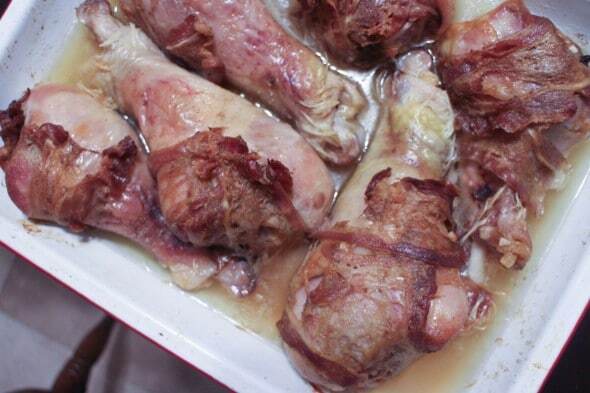 Pat the turkey legs dry with a paper towel. Once the turkey reaches room temperature, sprinkle your poultry rub evenly on both sides. One by one, wrap two or three pieces of kosher beef bacon around each leg. (If you have more than 1lb of bacon, I’d recommend six to eight pieces of bacon per leg). Pre heat the oven to 300 degrees and roast the turkey legs, uncovered for 2 hours. Then turn the heat up to 350 degrees for 30 minutes to crisp the bacon. Use a meat thermometer to make sure your turkey has an internal temperature of 165 degrees before serving.